This is the third chapter of the ketosis series. In 1878, German physician Dr Adam Hammer documented a strange new condition. While performing an autopsy he discovered that one of the coronary vessels had been blocked by a blood clot resulting in insufficient oxygen to the heart muscle (1). Hammer discussed this bizarre finding with many of his most knowledgeable colleagues, yet unfortunately “even the most learned” of them had never heard of such a case (2). Just over a century later, we now realize that what Hammer stumbled upon was the first documented case of a heart attack. ​In 1878, the western diet also contained considerably more naturally-occurring fat than it does today (3). The major oils consumed were derived from animals and consisted of lard (pig fat), tallow (beef fat), and butter and to a lesser extent coconut oil, palm kernel oil, and olive oil (3). Thus it would seem that during this time people ate large amounts of saturated fat and cholesterol yet heart attacks were so rare that even the most encyclopedic doctors had never heard of them. Heart disease is now the number one killer in the world. Even children know this. Yet if the average person on the street is asked what causes heart attacks, the standard response is to place much of the blame on saturated fat and cholesterol. We have the US scientist Dr Ancel Keys and his hugely biased 1950s publication, The Seven Countries Study, to thank for instigating this faulty perception. While Keys had access to information from 22 countries, he chose to publish data from only a handful - the handful that supported his own conviction that saturated fat and cholesterol consumption produced heart disease (4). In doing so, he conveniently ignored the data from all of the other countries, data that either failed to support or flat-out contradicted his own belief. It is now known that with all 22 countries included, there is no correlation between saturated fat consumption and heart disease (5). Yet the dogma remains. The trailblazing work of Keys combined with the ongoing profit-driven efforts of modern medicine, food companies, and governments around the world has culminated in a dietary culture in which fat is relentlessly demonized. However, fat is not the bad guy. Naturally-occurring fats may be classified based on the number of carbon-carbon double bonds in their molecular structure. Polyunsaturated fats have two or more carbon-carbon double bonds (examples include nuts, seeds, algae, and fish). Monounsaturated fats have one carbon-carbon double bond (some examples would be nuts, red meat, olives, olive oil, and avocados). Saturated fats have no carbon-carbon double bonds (examples include red meat, butter, cream, cheese, coconut oil, and palm kernel oil). The colossal health advantages associated with naturally-occurring polyunsaturated, monounsaturated, and saturated fats were outlined in chapter one. Unfortunately, there is a fourth category of fats that is an exception to the rule that fats are healthy - processed trans-unsaturated fats, or trans fats (3). The ‘trans” simply refers to the geometry of the fatty acids and is not important. What is important is that trans fats are rarely found in nature; most are produced artificially resulting in three of the most destructive food additives ever created - shortening (used in pastries; the original shortening was Crisco), margarine (an imitation butter spread that has to be dyed yellow to look more appetizing), and hydrogenated vegetable oils such as sunflower, safflower, cottonseed, canola, soybean, grapeseed, and corn oils (the main components in shortening and margarine, also used to make fast food such as pizzas, fries, and cookies as well as frozen food, snack food, and fried food - disturbingly, the majority of restaurants still use hydrogenated vegetable oils for cooking). Thanks to the introduction of shortening, margarine, and hydrogenated vegetable oils by the processed food industry, 10% of all fat in the modern western diet is now trans fat (3). Trans fats produce serious adverse effects on health. A 1993 publication using data from the enormous Nurses Healthy Study which followed 85,095 nurses over 14 years showed that the chances of suffering a heart attack were about 50% higher for nurses eating the largest amounts of trans fats compared to those eating the lowest amounts of trans fats (6). A 2006 comprehensive review of multiple studies also demonstrated a strong and reliable connection between the consumption of trans fats and heart disease, with trans fats conferring a substantially increased risk even at low levels of consumption (7). It has been estimated that dietary trans fats from hydrogenated vegetable oils may be responsible for 30,000 to 100,000 premature coronary deaths per year in the United States alone (8). To make a long story short - if a food package mentions shortening, margarine, or hydrogenated vegetable oils in the ingredient list, put it back on the shelf. The building blocks of fats are called triglycerides, which consist of a glycerol molecule glued to three fatty acids. Just as fats may be classified by the number of carbon-carbon double bonds in their molecular structure they may also be differentiated by the lengths of the carbon chains in their fatty acid constituents into short, medium, long, and very long chain triglycerides (very long chain triglycerides are rare). Most short chain triglycerides (SCTs) have 2-4 carbon atoms. The most common is the 4-carbon chain butyric acid found in whole milk products such as butter and cheese. Bacteria in the large intestine also produce SCTs from any fiber that is consumed; these SCTs are the main nutrient for the cells of the large intestine (9). The medium chain triglycerides (MCTs) have 6-12 carbon atoms. They consist of the 6-carbon chain caproic acid, the 8-carbon chain caprylic acid, the 10-carbon chain capric acid, and the 12-carbon chain lauric acid. MCTs may be found in whole milk products such as pure cream, butter, and cheese as well as in palm kernel oil, but the greatest natural source of MCTs is coconut oil. MCTs readily cross the blood-brain barrier to provide energy for brain cells known as astrocytes which in turn nourish and support neurons (10,11). Finally, long chain triglycerides (LCTs) have 13-21 carbon atoms. In the modern western diet, LCTs constitute 95% of all fat consumed; certain foods such as olive oil and lard consist of 100% LCTs (3). Due to their dominant presence LCTs are clearly an important energy source, however they cannot cross the blood-brain barrier and therefore they cannot be directly metabolized by the brain. MCTs are the “best of the best” fats. When ingested, some of them are converted into ketones by the liver while others are directly metabolized by organs such as the brain. Regardless of how they are metabolized, MCTs are not stored as fat - they are rapidly burned instead resulting in a higher rate of fat burning that includes LCTs and other fats, and not just dietary fat but body fat too (12,13). In fact, the postprandial resting metabolic rate increases by 50% or even higher after 30 g of MCTs (14), an effect that lasts for up to 24 hours (15). It has been proven that even tiny doses of MCTs significantly enhance whole body basal metabolism (16,17). One 2001 study examined 78 men and women over 12 weeks in which all subjects consumed the same calories per day, but one group consumed 10 g MCTs with 50 g LCTs whereas the other group consumed no MCTs but 60g LCTs - by the end of the study period, the MCT/LCT group had lost 6.1 kg and cut 5.7 cm off their waist circumference whereas the pure LCT group had only lost 4.8 kg and cut a less impressive 3.7 cm off their waist circumference (18). To use an analogy, MCTs are like rolled up newspapers whereas LCTs are like heavy wet logs; not only do the MCTs burn more brightly, they also help burn up the LCTs (3). When one considers the strikingly high prevalence of obesity and type II diabetes in the west, boosting basal metabolism and fat burning is clearly a good thing. 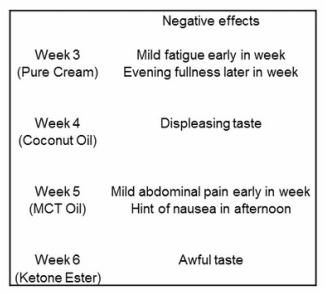 The next four weeks of experiments consisted of a comparison of four different ketogenic supplements - pure cream, coconut oil, MCT oil, and ketone ester. Three of these supplements contain various amounts of MCTs - pure cream consists of only a small percentage of MCTs but coconut oil contains 60-70% MCTs and MCT oil (which is basically fractionated coconut oil) consists of 100% MCTs. The fourth supplement was the primary circulating ketone itself, beta-hydroxybutyrate (BHB), in the form of a ketone ester. Throughout these four weeks, the supplement dose was chosen according to my own level of tolerability (remember, I was on a fasted stomach all day). To make the coconut oil, MCT oil, and keteon ester more palatable I mixed each of these ketogenic supplements with black coffee throughout the day. 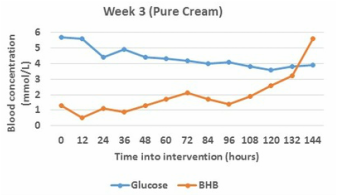 Figure 1 to the right shows blood glucose and BHB concentrations for the pure cream week (the standard weekday meal from chapter two plus 100 ml pure cream three times a day amounting to 90% recommended intake, 70% fat, 20% protein, and 10% carbohydrate per weekday). The mean blood glucose concentration was 4.36 mmol/L whereas the mean blood BHB concentration was a disappointing 1.95 mmol/L. There were no major dips in the blood BHB concentration but it took a long time to rise during the week. 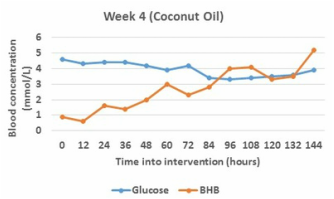 Figure 2 to the right shows blood glucose and BHB concentrations for the coconut oil week (the standard weekday meal plus three tablespoons coconut oil three times a day amounting to 90% recommended intake, 70% fat, 20% protein, and 10% carbohydrate per weekday). The mean blood glucose concentration was nice and low at 3.93 mmol/L whereas the mean blood BHB concentration was an excellent 2.67 mmol/L. There were no major dips in the blood BHB concentration and it rose rapidly during the week. 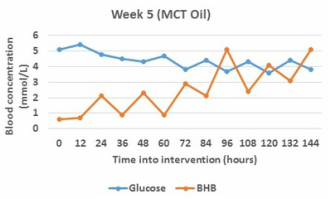 Figure 3 to the right shows blood glucose and BHB concentrations for the MCT oil week (the standard weekday meal plus two tablespoons MCT oil three times a day amounting to 75% recommended intake, 70% fat, 20% protein, and 10% carbohydrate per weekday). 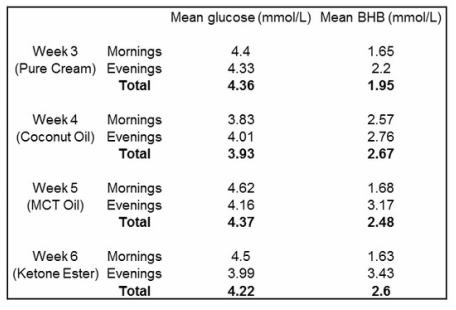 The mean blood glucose concentration was 4.37 mmol/L whereas the mean blood BHB concentration was a respectable 2.48 mmol/L. There were numerous morning dips in the blood BHB concentration yet it still rose rapidly during the week. 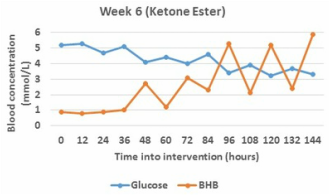 Figure 4 to the right shows blood glucose and BHB concentrations for the ketone ester week (the standard weekday meal plus two tablespoons ketone ester three times a day amounting to 55% recommended intake, 60% fat, 30% protein, and 10% carbohydrate per weekday). The mean blood glucose concentration was somewhat low at 4.22 mmol/L whereas the mean blood BHB concentration was an impressive 2.6 mmol/L. There were some morning dips in the blood BHB concentration yet it still rose rapidly during the week. In these experiments, coconut oil came out on top. It achieved the lowest mean blood glucose concentration as well as the highest mean blood BHB concentration. Moreover, coconut oil established a respectable level of physiological ketosis (almost 2 mmol/L) within 24 hours. Furthermore, there were no large fluctuations in the level of physiological ketosis - the blood BHB concentration just kept climbing as the week proceeded. Ketone ester came in at second place. While there were some impressive evening peaks during the second half of the week there were also some serious morning dips in the blood BHB concentration. Table 1. 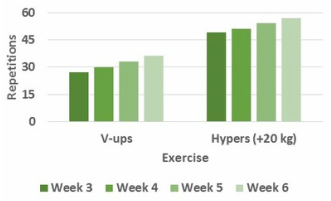 The level of physiological ketosis achieved for each week. Now to assess the effects of each ketogenic supplement on a mental, physical, and social level. In these experiments, the following observations were noted regarding cognition. During the pure cream week I experienced mild fatigue early in the week and the meals became more difficult to finish later in the week - the fatigue may have resulted from my body's relative inability to establish a decent level of physiological ketosis early in the week. Throughout the coconut oil week there were no negative effects on cognition but the taste was displeasing; some people enjoy the taste of coconut oil, I am not one of them. During the MCT oil week I experienced abdominal pain on the first day and persisting mild nausea whenever I was about to drink it with my black coffee - this mild nausea never fully disappeared. As to the ketone ester, there were no negative effects on cognition, however the taste was somewhat dreadful and I ended up ordering extra shots in my black coffee in my efforts to cover it up. Table 2. Comparing the negative effects of each week. The physical analysis showed ongoing improvements in strength during the four weeks of the different ketogenic supplements. Figures 5, 6, and 7 below relay the strength analysis for the Saturday evening resistance session. The x-axis shows the particular resistance exercise and the x-axis shows the number of repetitions done. For all weekends, the resistance session was done at a high level of physiological ketosis on Saturday evening. Body weight was measured at the same time on both days using the same scale while all exercises were done in the same order using the same equipment and the exact same weight. It is interesting to note that while body weight stayed the same or even slightly declined over the four weeks of ketogenic supplements, the number of repetitions increased - often dramatically - for every exercise despite five weekdays of catabolism and a mere 20 minutes of exercise per weekend. Once again, fat was burned and yet muscle was clearly spared from being broken down. Table 3. 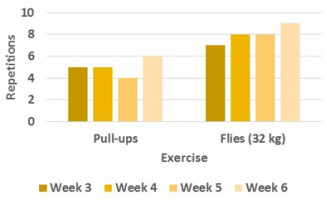 Pre-workout blood glucose and BHB concentrations, body weight, and total repetitions for the resistance session at the end of each week. During these experiments there were some important differences in cost from one week to the next. The weekday expenses of the pure cream and coconut oil weeks were low, but the weekend expenses increased a bit due to an increase in caloric intake. The weekday expenses of the MCT oil and ketone ester weeks were much higher - frankly, these two ketogenic supplements are expensive. Moreover, the weekend expenses increased even more as I seemed to require an even greater weekend caloric intake to establish a proper reset to a low level of physiological ketosis. Table 4. Comparison of weekday and weekend costs for each week. Hopefully you have a bit of a feel for several common ketogenic supplements by now. Take-home points from this chapter are as follows. (1) In the last 100 years, heart disease has gone from being an obscure phenomenon to the number one killer in the world today and during that same period of time the consumption of naturally occurring fats, including saturated fats, has declined - this fact alone should make one seriously question the dogmatic claim that increased saturated fat consumption is responsible for heart disease. (2) There is one exception to the rule that fats are healthy - processed fats called trans fats found in shortening, margarine, and hydrogenated vegetable oils are strongly associated with increased heart disease and should be avoided. (3) The "best of the best" fats are MCTs - not only do they possess the advantages of all fats regarding prevention of obesity and diabetes, they appreciably boost basal metabolism thus enhancing the metabolism of dietary fat as well as body fat. ​(4) In the comparison of pure cream, coconut oil, MCT oil, and ketone ester it was coconut oil that came out on top by achieving the highest level of physiological ketosis (mean blood BHB concentration 2.67 mmol/L) over the five weekdays. 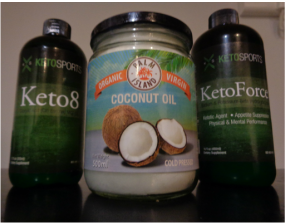 ​(5) Mentally - although the taste of coconut oil was somewhat displeasing, its side-effect profile was the best of all the ketogenic supplements. 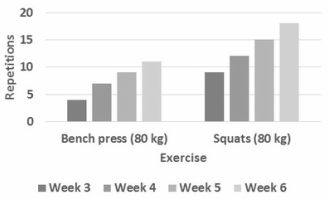 (6) Physically - despite five days of catabolism and only 20 minutes of exercise per weekend, strength continued to increase over the four weeks. (7) Socially - pure cream and coconut oil are not expensive, but MCT oil and ketone ester are rather costly. Coconut oil was the clear winner out of the four ketogenic supplements tested and despite its bothersome taste will be chosen as the standard supplement for the "best method" outlined in chapter two. The results presented here are highly encouraging, particularly the physical effects of cycling in physiological ketosis - weight remains stable even as strength continues to climb. The trick now is to add some variety to the catabolic weekdays. (1) Hammer. 1878. Thrombosis of one of the coronary arteries of the heart diagnosed during life (translated by Workman J). Canadian Journal of Medical Science 3(353). (2) Fye. 1985. The delayed diagnosis of myocardial infarction: it took half a century! Circulation 72(2), 262-271. (3) Fife. 2014. The Coconut Ketogenic Diet: Supercharge Your Metabolism, Revitalize Thyroid Function and Lose Excess Weight. Piccadilly Books. (4) DiNicolantonio. 2014. The cardiometabolic consequences of replacing saturated fats with carbohydrates or Ω-6 polyunsaturated fats: Do the dietary guidelines have it wrong? Open Heart 1. (5) Yerushalmy and Hilleboe. 1957. Fat in the diet and mortality from heart disease. A methodologic note. New York State Journal of Medicine 57, 2343-2354. (6) Willett et al. 1993. Intake of trans fatty acids and risk of coronary heart disease among women. Lancet 341(8845), 581-585. (7) Mozaffarian et al. 2006. Trans Fatty Acids and Cardiovascular Disease. NEJM 354, 1601-1613. (8) Zaloga et al. 2006. Trans Fatty Acids and Coronary Heart Disease. Nutrition in Clinical Practice 21(5), 505-512. ​(9) Tan et al. 2014. The role of short-chain fatty acids in health and disease. Advances in Immunology 121, 91-119. (10) Page et al. 2009. Medium-Chain Fatty Acids Improve Cognitive Function in Intensively Treated Type 1 Diabetic Patients and Support In Vitro Synaptic Transmission During Acute Hypoglycemia. Diabetes 58(5), 1237-1244. (11) Ebert et al. 2002. Energy Contribution of Octanoate to Intact Rat Brain Metabolism Measured by 13C Nuclear Magnetic Resonance Spectroscopy. The Journal of Neuroscience 23(13), 5928-5935. (12) Baba. 1982. Enhanced thermogenesis and diminished deposition of fat in response to overfeeding with diet containing medium chain triglyceride. American Journal of Clinical Nutrition 35, 678-682. (13) Papamandjaris. 2000. Endogenous fat oxidation during medium chain versus long chain triglyceride feeding in healthy women. International Journal of Obesity and Related Metabolic Disorders 24, 1158-1166. (14) Scalfi et al. 1991. Postprandial thermogenesis in lean and obese subjects after meals supplemented with medium-chain and long-chain triglycerides. American Journal of Clinical Nutrition 53(5), 1130-1133. (15) Dulloo et al. 1996. Twenty-four-hour energy expenditure and urinary catecholamines of humans consuming low-to-moderate amounts of medium-chain triglycerides: a dose-response study in a human respiratory chamber. European Journal of Clinical Nutrition 50(3), 152-158. (16) Hill et al. 1989. Thermogenesis in humans during overfeeding with medium-chain triglycerides. Metabolism 38(7), 641-648. (17) Seaton et al. 1986. Thermic effect of medium-chain and long-chain triglycerides in man. American Journal of Clinical Nutrition 44(5), 630-634. (18) Tsuji et al. 2001. Dietary medium-chain triacylglycerols suppress accumulation of body fat in a double-blind, controlled trial in healthy men and women. The Journal of Nutrition 131(11), 2853-2859.